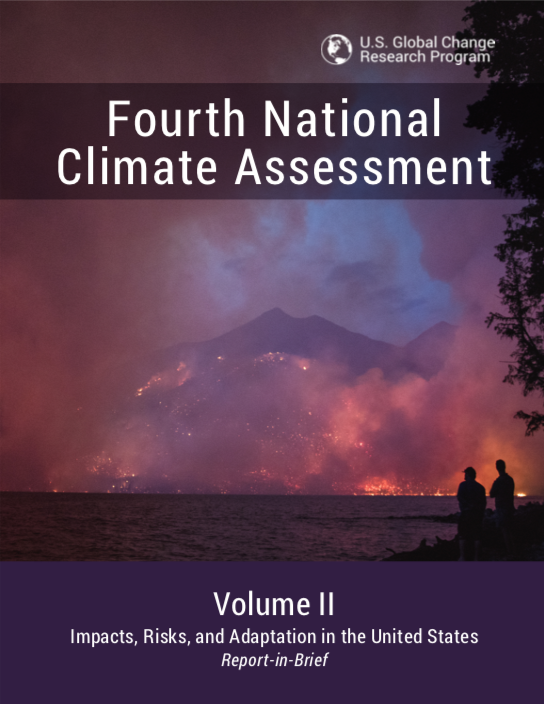 The new National Climate Assessment released Friday, November 23, describes how the impacts of climate change affecting the U.S. now and in the future. In this post, we focus on the four major impacts the report cites for the Southeast. “Earth’s climate is now changing faster than at any point in the history of modern civilization, primarily as a result of human activities. The impacts of global climate change are already being felt in the United States and are projected to intensify in the future—but the severity of future impacts will depend largely on actions taken to reduce greenhouse gas emissions and to adapt to the changes that will occur.” So begins the new National Climate Assessment. 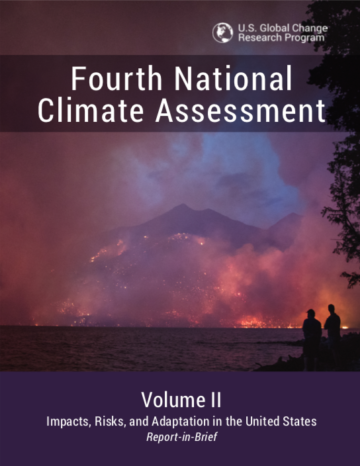 The National Climate Assessment is a quadrennial report from U.S. federal agencies that synthesizes a very detailed understanding about climate change globally and in the United States, according to the best peer-reviewed science available. The 2018 report, released Friday, November 23, describes how the impacts of climate change affect the U.S. now and in the future. Impacts are not equally felt across all geographic areas of the U.S.: In fact according to a recent economic study, residents in the South (along with those in the Midwest) are likely to suffer the largest economic losses from projected climate change in the country. Looking forward, experts expect much of the Southeast to have a climate similar to South Florida’s tropical climate by mid-21st century. So in this post, let’s focus just on the impacts the report cites for the Southeast. 4) Rural communities and agricultural and forestry economies will face dangerous extreme heat exposure, along with the associated health impacts and economic losses. The Southern Alliance for Clean Energy (SACE) continually pushes for clean energy solutions that will protect our region’s treasured ecosystems, grow local economies, and mitigate these dramatic climate change impacts. We push for policies and programs that lessen our region’s dependence on fossil fuels, reduce greenhouse gas emissions, and encourage the development of clean energy infrastructure so that we can head off impacts like these four topics and the effects they will have specifically in communities throughout the Southeastern U.S. Climate change is increasing the public health vulnerability of residents of Southeastern urban cities. A 2016 scientific assessment of climate change impacts to human health in the U.S. found that climate change is very likely to increase the number of premature heat-related deaths by thousands or tens of thousands each summer by the end of the century. Temperature increases will occur region wide, but will be particularly felt in urban areas with lots of pavement to absorb heat, a phenomenon known as the “urban heat island effect.” Since our region is home to “many of the fastest-growing urban areas in the country, including a dozen of the top 20 fastest-growing metropolitan areas (by percentage),” climate change effects such as increased heat exposure, vector-borne diseases, and decreased air quality are of particular concern here. Summer heatwaves are already worsening in cities around the Southeast, and future warming will dramatically raise temperatures and increase exposure to heat-related illnesses such as heatstroke, cardiovascular and respiratory complications, and death. Additionally, the socioeconomic factor of urban poverty found in cities, especially among older people, is strongly correlated with heat-related illness and death. Furthermore, climate change is expected to shift the geographic range, seasonal distribution, and abundance of disease vectors like mosquitoes. Experts expect that this shift will increase people’s exposure to the mosquito species Aedes aegypti, which can spread dengue, Zika, chikungunya, and yellow fever viruses. Urban residents’ exposures will increase more than rural residents due to higher population densities and other factors that promote mosquito breeding, like pools of standing water in tires, buckets, and so forth. The Southeast has more favorable conditions for this mosquito than any other place in the U.S., and therefore faces the greatest risk of the diseases it can spread. On top of that, urban air quality is a concerning issue for our region, especially considering that “the Southeast has more days with stagnant air masses than other regions of the country (40% of summer days) and higher levels of fine (small) particulate matter (PM2.5), which cause heart and lung disease.” Additionally, “Urban areas have higher concentrations of CO2, which causes allergenic plants, such as ragweed, to grow faster and produce more pollen than in rural areas.” In a future with rising atmospheric CO2 levels, allergens are of particular concern in cities. The effects of a changing climate on air quality in the Southeast are not yet known exactly and there are a diverse range of scenarios of future urban air quality, but it clearly presents a significant risk. 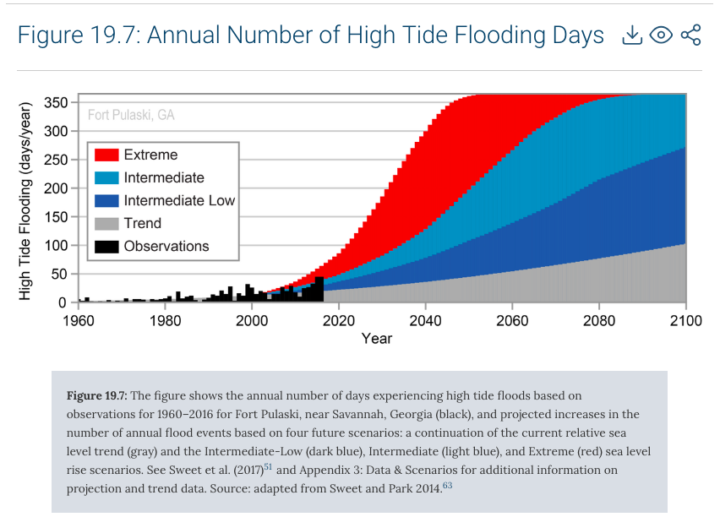 Flooding is already increasing in coastal and low-lying areas due to sea level rise and heavier rainfall and is expected to dramatically increase in severity in the years to come. Historic sea level rise around the globe has been about 8-9 inches from 1880 to present, but the rate of rise has hastened over the past 30 years, with about 3 inches of the total rise occurring since 1990. Combined with land subsidence, rising seas have meant about 1 to 3 feet of local relative sea level rise in the past 100 years in low-lying areas of the Southeast. As such, coastal flooding during high tides has increased 5- to 10-fold since the 1960s in several low-lying coastal cities in the Southeast, such as Wilmington, Charleston, Mayport, Miami, Key West, and Fernandina Beach. Looking to the future, seas are expected to rise by 1-4 feet over the course of the 21st century, but could potentially rise as much as 8 feet. This will mean much more high tide flooding all along the Southeast coast, and that storm surge from large storms will push flood water higher and farther inland than before. According to the report, “The combined impacts of sea level rise and storm surge in the Southeast have the potential to cost up to $60 billion each year in 2050 and up to $99 billion in 2090 under a higher [carbon pollution] scenario.” Not to mention the fact that millions of people’s homes could become underwater. The trend of heavier downpours compounds the flood risk of sea level rise. 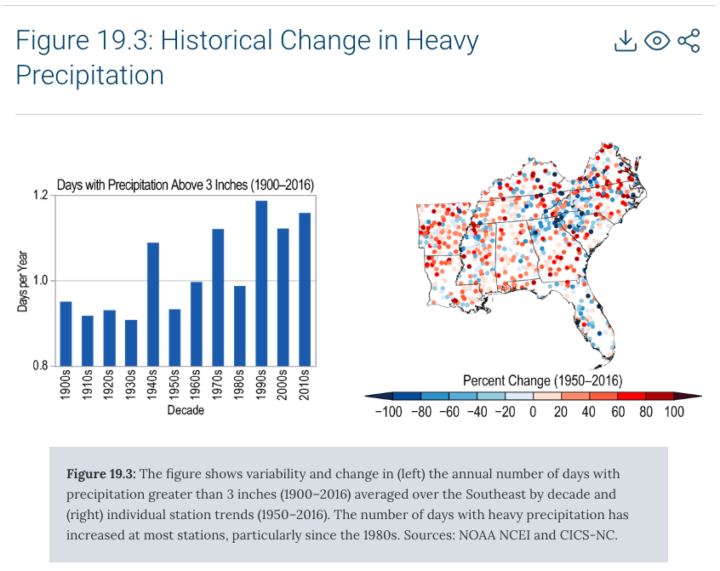 Rainstorms have gotten heavier around the Southeast and are expected to become even worse in the future: By the end of the 21st century, under a scenario with inadequate reductions in carbon pollution, it is projected that the Southeast will have twice as many heavy rainfall events and the heaviest rain storms will drop 21% more water. As winter minimum temperatures change, more tropical species are making their way northward. And while this shift may present some beneficial opportunities, for examples citrus species such as oranges and lemons could be grown in a larger area of the Southeast, which poses agricultural market opportunities, the shift could also have severe negative effects as tropical invasive species such as the Burmese python and Brazilian pepper tree, which have altered the ecosystem of the Everglades, move farther north. While the largest and most newsworthy wildfires generally take place out west, the Southeast actually has a greater number of total fires (albeit smaller than the huge Western fires). As the climate changes, wildfires are expected to have significant impacts on natural ecosystems in the Southeast. With the climate trending toward rising temperatures and longer, more intense drought, wildfires like the Southern Appalachian fires of 2016, which were the worst wildfires in the region in a century, are expected to increase in occurrence. The Southeast’s rural communities can expect to suffer disproportionate hardships from climate change, especially since so many people in rural communities have traditional livelihoods that rely on natural resources which will be affected by climate change. One of the biggest impacts to rural communities will be the increase in extreme heat, which will pose health risks and harm the economy, particularly to workers in the agriculture, forestry, hunting, and fishing sector, along with construction and support, waste, and remediation services. 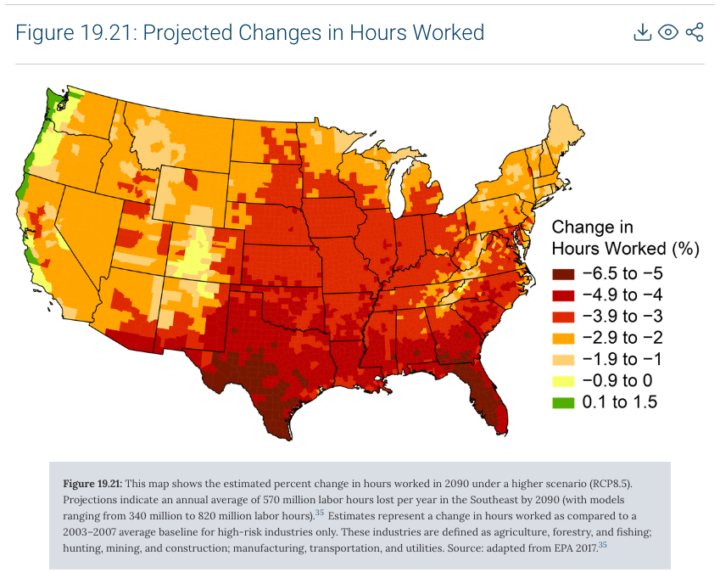 “By 2090, under a higher [carbon pollution] scenario (RCP8.5), the Southeast is projected to have the largest heat-related impacts on labor productivity in the country, resulting in average annual losses of 570 million labor hours, or $47 billion (in 2015 dollars, undiscounted), a cost representing a third of total national projected losses” if no additional adaptation actions are taken. Climate change will bring increases in “temperatures, water stress, freeze-free days, drought, and wildfire risks, together with changing conditions for invasive species and the movement of diseases, create a number of potential risks for existing agricultural systems.” Many crops are less productive in higher temperatures, including cotton, corn, and soybeans, and livestock is subject to heat stress. Tree crops such as peaches and pecans are reliant upon cold weather during the winter in order to fruit properly, and warmer temperatures may mean that those “chill hours” may not occur or shift the spring bloom period earlier so that blossoms and fruit are vulnerable to late spring freezes. Increasing risk of wildfire in a warmer future with more drought will affect the Southeast forestry, which is the Southeast’s most valuable crop. Furthermore, climate change impacts serve as multipliers of already-existing stresses of rural communities, such as persistent rural poverty. “[R]ural counties in the region are experiencing higher levels of population loss (13% of rural counties lost population) and low educational attainment (38% of rural counties), with 35% of rural counties experiencing poverty rates of more than 20% persisting over approximately 30 years.” Access to healthcare is also of major concern for our rural communities, especially considering that “[b]etween 2010 and 2016, more rural hospitals closed in the Southeast than any other region, with Alabama, Georgia, Mississippi, and Tennessee being among the top five states for hospital closures.” And as health impacts from hotter temperatures and associated problems grow, there will be an increasing need for quality healthcare, yet healthcare in many rural areas of the Southeast in in decline. Furthermore, as temperatures increase and people need to use more air conditioning to stay comfortable and safe, the Southeast is expected to experience the highest energy costs of any region, exacerbating the problem of rural poverty. SACE is working to protect our region from the worst of these grave impacts and to promote solutions like clean, renewable energy and energy efficiency. Our staff throughout the region is working with utilities to promote smart policies and programs that advance clean energy solutions, and with governments to develop forward-thinking collaborative concepts like the Tampa Bay Regional Resiliency Coalition, which we supported and are continuing to facilitate. We are also working with residents in historically disadvantaged and low-income communities to support energy efficiency programs that will save energy customers money and improve quality of life. To learn more about SACE’s work to mitigate climate change impacts in the Southeast, please visit our website, www.cleanenergy.org, or contact me directly at chris@cleanenergy.org. Together we can do so much! Green New Deal: an Energy Policy, a Climate Movement, or Both? What are our motivations, year after year, to do what we do? The Southern Alliance for Clean Energy family reflects and looks forward to a clean energy future in 2019.